Used Jaguar S-Type Review - 1998-2008 | What Car? 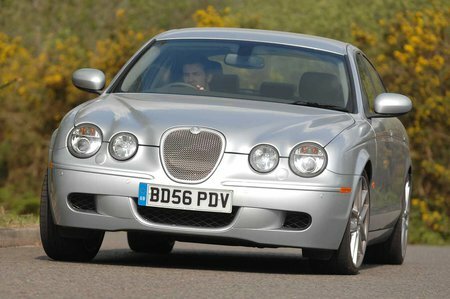 What's the used Jaguar S-Type saloon like? When the S-type arrived in 1999, it looked like it had just driven off the set of The Sweeney. Most models had even a classic wood and leather interior to match, but underneath the car was every bit as modern as its German rivals. While the S-type may not have the ultimate poise of the BMW 5 Series, its handling is still very good, thanks to an agile chassis and precise, accurate steering. Optional CATS suspension sharpens up the responses further, and every model performs well, with not a duff engine in the range. Electrically adjustable pedals are an option on later models, but even without them, getting a good driving position is easy. However, the centre of the dashboard contains an almost bewildering array of buttons, and tall back seat passengers will find their heads brushing the roof. There could be more stowage in the cabin, too, and the boot opening would be better if it was wider.